PHOENIX — For Diamondbacks relief pitcher J.J. Hoover, signing with the team in January marked the beginning of a new chapter. Off the field, another experience has given birth and is in the early stages for the hard-throwing right-hander. “I want to try and be as self-sustaining as possible,” he said. “It can certainly be overwhelming. We have no idea what we’re doing,” she said, laughing. On the field, Hoover has a strong understanding of his role. After signing a minor-league deal with the Diamondbacks and receiving an invitation to spring training, he allowed no earned runs in 10 innings and earned a spot in the bullpen. He is 1-0 with 35 strikeouts this season and has not allowed a run in his last 15 appearances. In Cincinnati, he appeared primarily in relief situations for a ball club known for its struggles in recent years. Near the end of his time there, he and his wife, Megan, decided to move forward with a decision they had always wanted to make: purchasing a large piece of land. “My dream is to have over 640 acres,” Hoover said. It is certainly a dream within his reach but for now, his goal for the farm is self-sustainment. Through research and being around sports most of his life, Hoover said he found that much of the food at grocery stores simply isn’t as nutritious as it should be. Upon that discovery, Hoover has dedicated more of his time to learning about ways he can provide healthier food for himself while also giving back. He recently finished a book, The Omnivore’s Dilemma, about a rancher in North Dakota who has talked openly about soil health and no tilling, which is simply turning over and breaking up soil. Hoover doesn’t want to take part in sustainable agriculture as much as he wants to regenerate the land. He wants to build it up as much as possible instead of just supplementing it with chemical fertilizers and pesticides. Last July, the couple decided to close on the 65-acre piece of land. Until this past year, J.J. and Megan had little to no experience with raising animals and taking care of them. J.J. grew up in Pennsylvania and Megan grew up in Washington and rest assured, neither of them had any prior experience with farming. “My mom is a terrific gardener,” J.J. said jokingly when talking about his lack of experience. “I don’t think I ever really knew how much work was going to be involved,” Megan said. 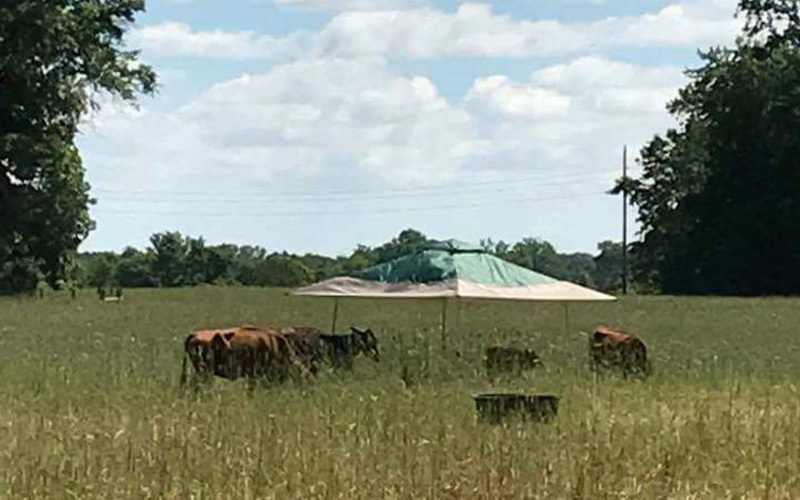 The Hoovers own five cows which are mostly breeding stock and are working on adding their first beef cattle to the mix this summer. They also own donkeys and would like to add a third horse so that friends are able to join them on rides when visiting. “J.J. really wants chickens,” Megan said. Their farm is in the southeastern part of Ohio and in the shape of a large rectangle. Upon entering the property, a picturesque pond “almost like a park setting” awaits, Megan said. When visitors wind their way down the gravel driveway, they find the couple’s home. About 60 yards behind it is a barn where their horses live. To the left, they have plans to build a riding arena and bullpen for their steer as well as a cow- sorting area. Just behind the barn sits two horse pastures. One field is in the process of “going up” Megan said, while the other is used as feed for the horses. Behind the two horse pastures are 16 to 17 acres of cow pasture, along with about a 12-acre space of wooded area. The couple hopes to someday add to their property there by building another home. Before they can do that, J.J. and Megan will have to begin building the ties within their community. Once they are able to become self-sustainable, they can then begin establishing a business name and a product to market, and then a client base. They have a close-knit church family about 40 minutes from the farm, where they used to live, so they hope to start there. While they are still in the process of building the barn, adding things to the farm and gathering more animals, Megan is anxious for additional help. Her days on the farm are tasking and she hopes to be able to hire someone full time by the end of the year, once they have more cattle and chickens. “My days are crazy right now. I would love to be able sit down and eat a few times a day,” she mused. With the Diamondbacks’ season in full swing, the Hoovers may have their hands full with their new found pleasure, but they certainly have a plan.